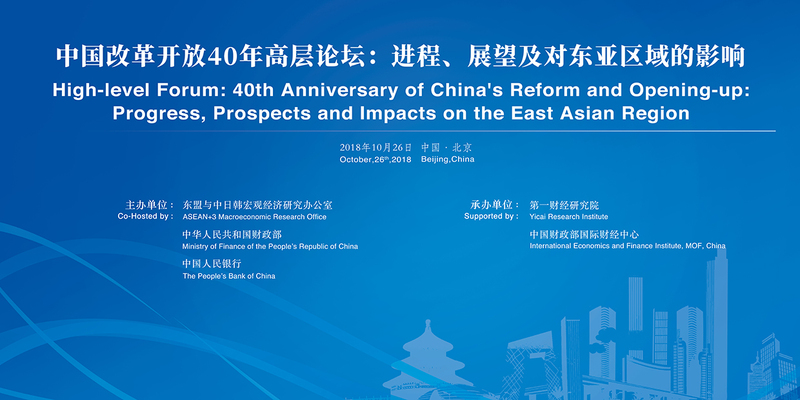 The High-level Forum on “40th Anniversary of China’s Reform and Opening-up: Progress, Prospects and Impacts on the East Asian Region,” co-organized by the ASEAN+3 Macroeconomic Research Office (AMRO), the Ministry of Finance of China, and the People’s Bank of China will be held on October 26, 2018 in Beijing, China. The Forum will bring together high-level policymakers, renowned academics, and senior representatives from international organizations and the private sector, to discuss the experience and lessons of China’s reform and opening-up as well as implications and prospects for the East Asian region. In addition to these two main topics, the development and reform of China’s financial markets and its impact on the global and regional markets will also be discussed at a working lunch. Over the past 40 years, China’s reform and opening-up has led to leapfrogging economic development and the expansion of China’s role at the regional and global levels, as shown by the close economic ties with its neighboring countries. While these achievements have become the bedrock for further development, China still needs to tackle several challenges to ensure a steady and sustainable growth path toward a modern industrialized economy. At the same time, neighboring countries also need to take stock and understand the implications of China’s increasing economic weight and linkages with the region so that both sides can better benefit from the growing economic ties and strengthening cooperation. 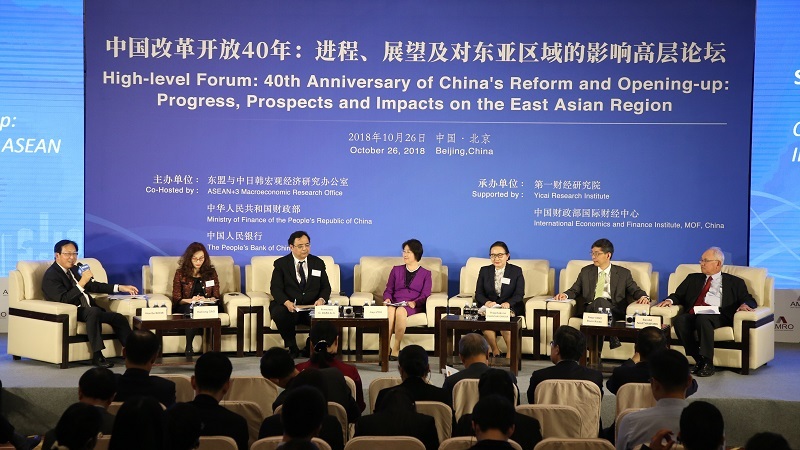 AMRO’s research titled “China’s Reform and Opening-up: Experiences, Prospects and Implications for ASEAN” launched in Beijing on October 25 will be used as background information for discussion. The event will be open to interested participants and the media. Please go to the registration page to register for the event. China’s reform and opening up since 1978 has been a landmark policy with a far-reaching impact not only on China but also on this region and the global economy. China’s economic structure and its macroeconomic policy and management have undergone tremendous changes, resulting in leapfrogging growth, a massive increase in productive capacity and level of economic development, and dramatic improvements in the standards of living of the people. A review of the main experiences and lessons over the past 40 years in reforming key aspects of the economy including the development of a market economy, reform of the state-owned enterprises (SOEs), public finance, financial system, the trade and exchange rate regimes, and macroeconomic management, will benefit future policy deliberations, and provide unique perspectives and insights for other emerging and developing economies. Moving forward, it is important to assess the future prospects and structural changes based on the intended reforms and potential challenges. Amidst the deepening of China’s reform and opening up process, East Asia, especially ASEAN, has developed close economic and trade ties with China. Looking ahead, with the rapidly growing middle class and improvements in social safety nets, the share of consumption in the Chinese economy will grow further, presenting opportunities for ASEAN in the form of trade in consumer goods as well as outbound tourists from China. The “Belt and Road Initiative” will deepen investment linkages between China and ASEAN. At the same time, China’s industrial upgrading and technological advancement and relocation of labor-intensive industries to ASEAN economies are expected to further affect the dynamics of trade and investment flows between them. While China will further reform, open up, and adjust its economic structure along the plans formulated at the 19th CPC National Congress, ASEAN economies will also undergo further developments and become a sizeable market. Opportunities and challenges will be discussed to identify the prospects for increased trade, tourism, investment and financial linkages, and areas for further cooperation. 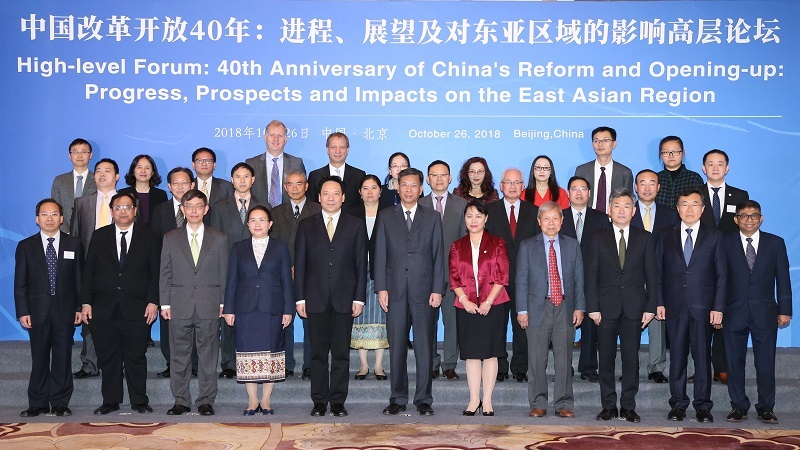 A warm welcome to the High-level Forum on 40th Anniversary of China’s Reform and Opening-up: Progress, Prospects and Impacts on the East Asian Region co-organized by the ASEAN+3 Macroeconomic Research Office (AMRO), the Ministry of Finance of China, and the People’s Bank of China. In such a historically important year of China’s evolution, the world is looking forward with keen interest: the next stage of China’s healthy development, and equally important, the role of neighboring countries in the shared journey ahead. In this context, since the beginning of this year, AMRO, as the regional macroeconomic surveillance organization, has conducted a study titled “China’s Reform and Opening-up: Experiences, Prospects and Implications for ASEAN,” which was launched yesterday here in Beijing. The study aims to take stock of experiences of and lessons learned from China’s reforms and opening-up as well as the impact on ASEAN economies; and analyze China’s growth and changing economic structure in the next 15 years and implications for ASEAN. Our study shows that from 1978 to 2018, China has transformed itself from a low-income to an upper-middle income country, with an average GDP growth of 9.4 percent. At this juncture, China is poised to reach a high-income status in the coming years with a per capita GDP of around USD 22,000 in 2035. In the same course of time, China’s share of the world GDP has increased significantly from less than 2 percent to above 15 percent while its share of world’s total trade has surged from less than 1 percent to almost 12 percent. Over the past two decades, China and ASEAN economies have become more integrated and both sides have benefited substantially from the rapid economic integration in the region in the areas of trade, investment and tourism. As a share of China’s trade, China-ASEAN trade is expected to rise from 10.4 percent in 2017 to 15.8 percent in 2035. Similarly, as a share of ASEAN’s trade, China-ASEAN trade is expected to rise from 16.7 percent in 2017 to 20 percent in 2035. However, for China, the economic reform and opening-up journey is still not complete with both opportunities and challenges ahead. At the same time, China and ASEAN should deepen integration and enhance mutual understanding to sustain mutual benefits. The Forum today is an excellent opportunity for us to discuss key issues concerning China’s development path and the prospects of China-ASEAN’s engagement and integration. I am very delighted to see a good mix of high-level policymakers in China and the ASEAN+3 region, renowned academics, and senior representatives from international organizations and the private sector in the panel as well as in the audience today, who have first-hand experience in the reform and opening-up process in China as well as the development of China-ASEAN’s integration. Understanding the past is key to move toward the future. Many of you today have deeply involved in shaping up and implementing the government’s policies in the past four decades. Some of you came to China in early the days of the reform to provide policy advisory to the government from international perspectives and have since then continued engaging in the process along the way. Some of you from other countries have witnessed China’s economic transformation and directly contributed to facilitating integration and cooperation between China and the rest of ASEAN+3. Your insightful experience and observations are invaluable and I really look forward to hearing your insights throughout a very comprehensive agenda that we have today. Taking this opportunity, I would like to thank the Chinese and ASEAN+3 authorities, speakers, discussants and all participants for joining us today. In particular, I would like to express our sincere thanks to our local partners, the Ministry of Finance of China and the People’s Bank of China, for the strong collaboration in organizing this event. Our gratitude also goes to the International Economics and Finance Institute and Yicai Research Institute for the excellent support in organizing this Forum. Thank you and I hope you will find the discussions insightful, illuminating, and enriching. Mr. Kun Liu, Minister of Finance of China (first row, middle); Mr. Yulu Chen, Deputy Governor of the People’s Bank of China (first row, fifth from left), Dr. Junhong Chang, Director of AMRO (first row, seventh from left); and panelists and discussants of the High-level Forum. BEIJING, October 26, 2018 – China’s major reforms and opening-up to international trade and investment have transformed the country from a low-income to an upper-middle income status, but more efforts are needed as the country aspires to move towards a modern economy. The East Asian region has benefited from increasing linkages with China and enhanced cooperation between them is crucial moving forward. 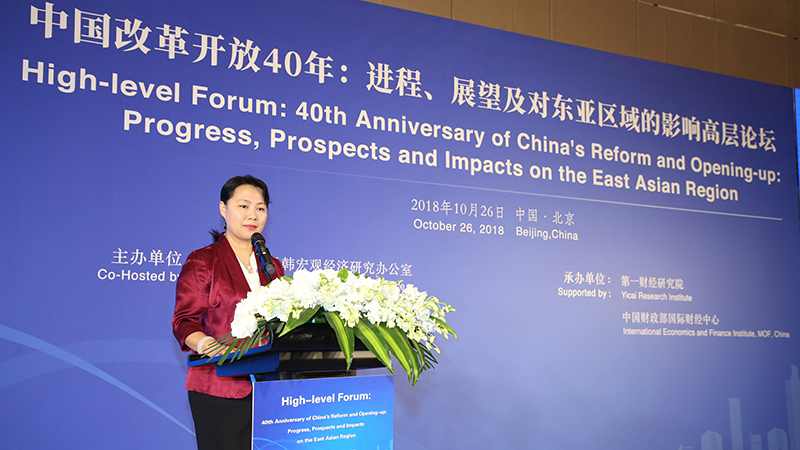 This was highlighted by speakers and participants at the High-level Forum on “40th Anniversary of China’s Reform and Opening-up: Progress, Prospects and Impacts on the East Asian Region” in Beijing today. Co-organized by the ASEAN+3 Macroeconomic Research Office (AMRO), the Minister of Finance of China (CMOF), and the People’s Bank of China (PBOC), the forum used AMRO’s recently published study titled “China’s Reform and Opening-Up: Experiences, Prospects and Implications for ASEAN” as a background document for discussions. Panelists include high-level policymakers from China and the ASEAN+3 region, distinguished academia, senior representatives from international organizations and the private sector. Mr Kun Liu, Minister of CMOF, and Mr Yulu Chen, Deputy Governor of PBOC, delivered the keynote speech. AMRO Director Dr Junhong Chang delivered the opening remarks. 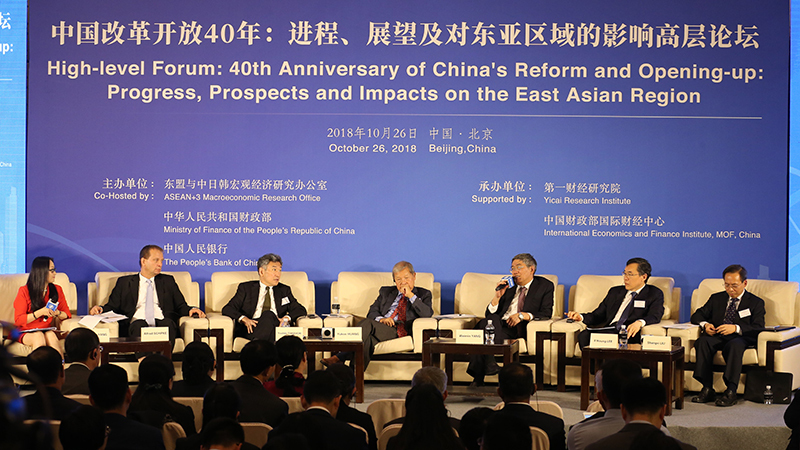 In the first session on experience and lessons from China’s reform and opening-up, the panel agreed that pragmatism and flexibility in policy-making has allowed the leadership to gear the path of reform and make steady progress despite significant headwinds. China has gradually shifted from the central-planning system toward market mechanisms, which has helped increase efficiency of resource allocation. Panelists in the first session. From left to right: Dr. Yanqing Yang, Deputy Editor-in-Chief of China Business News, Managing Director of Yicai Research Institute; Mr. Alfred Schipke, Senior Resident Representative in China, International Monetary Fund; Mr. Yoshiki Takeuchi, Director-General of the International Bureau, Ministry of Finance of Japan; Dr. Yukon Huang, Senior Fellow, Asia Program, Carnegie Endowment for International Peace; Prof. Weimin Yang, Deputy Director of the General Office of CPC Central Leading Group for Finance and Economics; Dr. II Houng Lee, Member of the Bank of Korea’s Monetary Policy Committee; and Dr. Shangxi Liu, President of Chinese Academy of Fiscal Science. Over the past four decades, China has seen an annual average growth rate of 9.4 percent. China’s share of the world GDP has increased significantly from less than 2 percent in 1978 to above 15 percent in 2018, while its share of world’s total trade has surged from less than 1 percent to almost 12 percent in the same period. However, the panel also noted that the economic reform and opening-up journey is still not complete with both opportunities and challenges on the way. Emerging opportunities include an ability to adopt and increasingly create new technologies, a growing number of large homegrown private enterprises with global branding, continuing urbanization, further market-oriented reforms, scope for fiscal policy in facilitating and supporting supply-side reforms and improving inclusiveness, and strengthened regional integration. Meanwhile, challenges for China to transforming itself into an advanced economy include ageing population, growing regional disparities and income inequality, high corporate sector debt and financial sector leverage, and environmental problems. External tensions and risks from trade and technology protectionism may persist into the medium term. In the second session on implications and prospects for ASEAN, the panel highlighted that amidst the deepening of China’s reform and opening up process, East Asia, especially ASEAN, has developed close economic and trade ties with the country. This was jumpstarted by the multinational companies establishing regional production networks with China as the centers and ASEAN as the nodes for production of manufacturing components. Meanwhile, investment from China to ASEAN has grown rapidly and the number of Chinese tourists has increased significantly in ASEAN. Panelists in the second session. From left to righ: Dr. Hoe Ee Khor, Chief Economist of AMRO; Prof. Haihong Gao, Chinese Academy of Social Sciences (CASS); Dr. Francisco G. Dakila, Jr., Assistant Governor, Monetary Policy Sub-Sector, Bangko Sentral ng Pilipinas; Madam Jiayi Zou, Vice Minister of Finance of China; Madam Thipphakone Chanthavongsa, Vice Minister of Finance of Lao PDR; Mr. Peter Ong Boon Kwee, Chairman of Enterprise Singapore, Senior Economic Advisor of Ministry of Trade & Industry of Singapore; and Dr. Bandid Nijathaworn, Former Deputy Governor of the Bank of Thailand. Looking ahead, with the rapidly growing middle class and improvements in social safety nets, the share of consumption in the Chinese economy will grow further, expanding opportunities for ASEAN in the form of trade in consumer goods as well as outbound tourists from China. The “Belt and Road Initiative” will deepen investment linkages between China and ASEAN. At the same time, China’s industrial upgrading and technological advancement and relocation of labor-intensive industries to ASEAN economies are expected to further affect the dynamics of trade and investment flows between them. The panel also emphasized that while the path of rising mutual benefits ahead has been paved by considerable efforts from both sides, enhanced cooperation including in the area of regional financial safety nets based on a deep understanding of each other’s needs and concerns is crucial moving forward.